When you leave a few words with the person next to you, instead of digital note written with your computer, you can pass your warm heart with handwriting memo. You can put this memo pad on your desk and use it anytime freely, when you write down the schedule for today and take a simple message. The second product of Memo Block series whose motive comes from pattern of marbles. 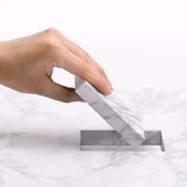 This is the Pocket memo, feeling the texture of the marble seemed like just had been chopped from the White marble.